* Largest volume recovery rate in Market. * Revolutionary double piston oil less compressor. * Auto low pressure switch for durability of compressor. * Safety high pressure switch. * Simple internal structure for field service. 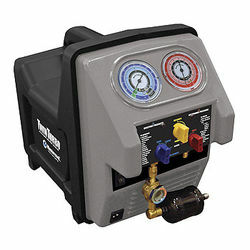 * For use with all refrigerants including R410A. * Comes with an oil separation module, filter dryer and sight glass. * A Quality product from Mastercool, USA. * Largest volume recovery rate in Market. * Revolutionary double piston oil less compressor. * Auto low pressure switch for durability of compressor. * Safety high pressure switch. * Simple internal structure for field service. * For use with all refrigerants including R410A. * Comes with an oil separation module, filter dryer and sight glass. * A Quality product from Mastercool, USA.